A creative and inspirational place in which to share quilting and sewing projects. I received the following press release from Lullubee.com. NEW YORK, N.Y., July 17, 2012 – Lullubee.com is a new online arts and crafts retailer offering high quality, ready-to-make DIY classic craft project kits that craft fans can make with their friends and family or can choose from a line of ready-made, one-of-a-kind craft items that are conveniently delivered to the customer’s doorstep with free shipping to anywhere in the USA. Lullubee is crafting made easy by eliminating the guesswork about DIY craft projects. Lullubee designs the craft project, sources the project materials, provides a list of tools needed to complete the project, shares the crafting techniques in an easy-to-follow video tutorial and leaves customers with the fun part: creating beautiful, unique handcrafted objects. All of lullubee’s project materials have been sourced from around the world to ensure the finest materials available for each project that make little impact on the environment. Craft projects range from basic to advanced skill levels to be enjoyed from ages 5+. Gold Collection: Featuring beautiful craft projects that are lullubee customer favorites and are offered all year long. The lullubee Gold Collection craft boxes include all materials, detailed instructions and an easy-to-follow video tutorial. Birthday Craft Kits: An ideal way to give kids a fun project to do on their own or are perfect as a group activity for a birthday party. Projects make a lovely memento for kids to take home with them. Birthday Craft Kits are available all year round with a volume discount if purchased for a group. Jewelry Kits: Popular DIY jewelry projects with elegant components that can be customized to create one-of-a-kind jewelry. Projects materials are easy to assemble for customers of all skill levels to craft and enjoy. Made by Artist: Features crafts made by lullubee’s in-house artists or special guest artists. These crafts are completed projects and are available in limited quantities. Lullubee was founded in June 2012 by Tiffany Dekel, an online entrepreneur who has been responsible for three successful online agencies and Laura Lee Burch, a former illustrator and professional crafter who has published several books about creating handmade gifts inspired by toys, dolls and costumes and also teaches felting at Shenkar University. Many craft projects in lullubee’s Gold Collection and the Craft of the Month Club are classic crafts inspired by Dekel and Burch’s childhood memories that have been popular for generations. Lullubee plans to add a seasonal décor and holiday gift line in September featuring craft projects for Halloween, which includes a playful collection of Trick or Treat costumes and DIY craft kits for Christmas, Hanukkah and New Year’s. All of lullubee’s collections feature free shipping to anywhere in the USA. Lullabee is an online arts and crafts retailer created to unleash the crafter in you. Founded in 2012 by Tiffany Dekel and Laura Lee Burch, lullubee is based in New York City and its mission is crafting made easy. Lullubee offers a line of ready-to-make DIY classic craft project kits featuring easy-to-follow video tutorials that craft fans can make with their friends and family and a collection of ready-made, one-of-a-kind craft items made by lullubee’s featured artists. For more information about lullubee, visit www.lullubee.com. Though I've fallen quite far behind in quilting, and haven't done much lately, I do subscribe to the lovely Quilting Daily newsletter, and found today's article quite inspirational. I'm one of these quilters who loves to start projects, but hates finishing them. That's unfortunate, since the quilting is my favorite part. At any rate, today's blog post by Vivika, "New Life for Your UFOs with Re-imagined Quilt Designs," is simply fantastic. You must check it out! There's a new DVD of Save My UFO [unfinished object] (as seen Quilting Arts TV) that show these segments, available for preorder from the Interweave store, and also a gallery, where you can get advice on your own UFOs. The Sydney skirt in black, baby blue and mustard. It has a pink waistband. I know, the colors out today in the stores are showing a lot of black and gray, but you need to pick up the latest Vogue and Elle magazine, and you'll see a lot of color. Please check out my Aunt Greta's Etsy shop! Check out my aunt's new Etsy shop, Not Just Bags. 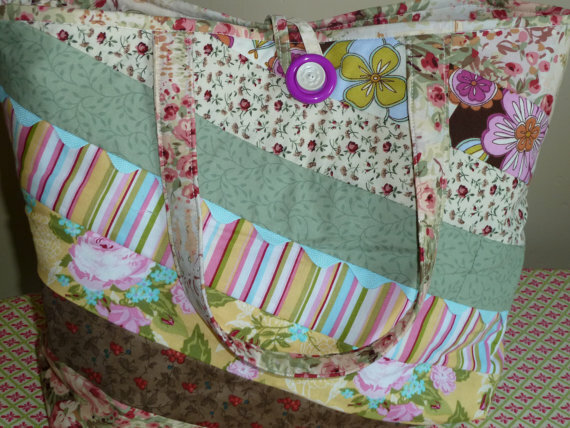 She has lots of cute make-up bags, scrappy totes and custom pieced totes for your use. I've seen her work--it's really high quality!--and the make-up bags are priced at just $10, and the totes just $30. Her work is a labor of love, and you'll get a big does of it when you buy one of her pieces of art. Thanks for looking, and adding her to your favorites and your circle. 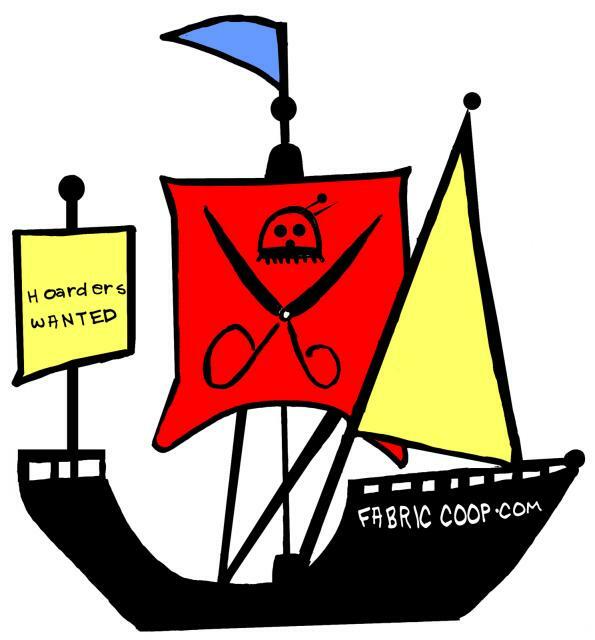 On St. Patrick's Day, March 17, 2011, you can save 50% on all cotton prints through noon only at the Yardage Town. Also, add some luxury silk shantung to your quilt at 50% off, too. My local YT has the most lovely selection! IF you haven't been to Yardage Town before, you can use this coupon to save 20% off your first purchase. Ebates. Get cash back from Fabric.com and Joann! Asian Grocery Store Haul // New Video!